I just added a Feedburner widgetty doohickey (over thar —> if you’re actually on the site). I don’t really understand Feedburner except that I always seemed to have no subscribers when I know for a fact I have at least three! Well anyway, there it is. If nothing else that burning Eye Of Sauron Zero will humble me daily. Not that I aren’t ever so ‘umble already, me. I don’t recall if this was a Yes cover or not. Asia perhaps? 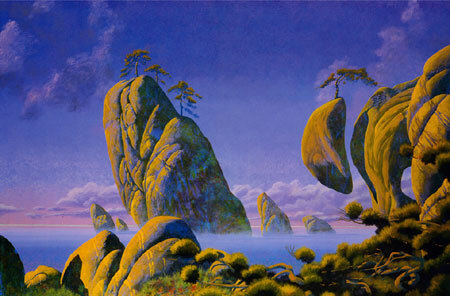 Either way, such a student of Progressive Rock as I, it’s obviously a Roger Dean piece. For all I know I’m being incredibly obscure, too. It’s one of those things I’ve had in my head for nigh-on 30 years so to me it’s obvious, which isn’t to say it should be for anyone else. May i recommend using the wordpress plugin called FD Feedburner Plugin. This allows all existing feeds to redirect your existing RSS feeds to your Feedburner feed and thus allow you to track them easier. That said… I’m not too bothered about the subs numbers at the end of the day. It’s nice to see, but since I don’t intend to use adverts or anything, it’s really just another random number. I just remembered grappling with FB when I first started the blog, and it didn’t make much more sense to me this time around when I got prodded to try it out. At least the counter widget was easy to use.